Is the Cavalier Hotel in Virginia beach haunted? 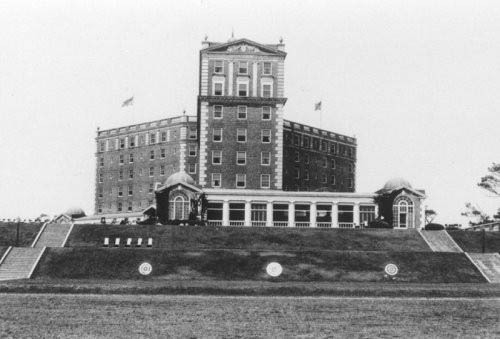 The Cavalier hotel opened on April the 4th, 1927. Its construction took 13 months and had as many as 220 men working at one time. The hotel remains open today and is considered a high quality stay for famous people, previous guests include Dwight D. Eisenhower, Richard Nixon, and five other US Presidents. Visitors report mysterious orbs showing up in their photos and hearing footsteps where no one is seen walking. A popular tale revolves around sightings of an older African American gentleman dressed in the hotel’s old staff uniform. Guests report that he stands on the staircase of the sixth floor and warns people of ghosts ahead. Unfortunately, it seems he himself is a ghost, as there hasn’t been any staff to fit his description working at the hotel in more than a few years.